Leong’s Legends Continue review – second time lucky? 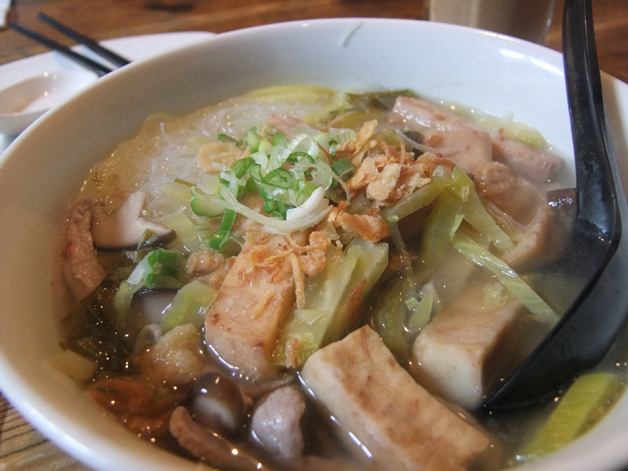 Soho’s Taiwanese stand-by – dependably reliable or depressingly staid? It’s quite interesting dining out in a group, if only to see what my dining companions will order when left to their own devices. During my recent revisitation of Leong’s Legends Continue, The Lensman, Templeton Peck and Happy Buddha displayed an alarming degree of groupthink – they all ordered exactly the same thing. 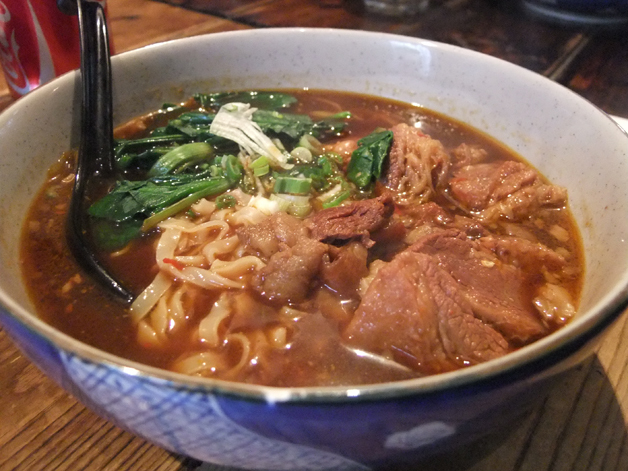 At least they all ordered what is clearly one of Leong’s Legends signature dishes – the Taiwanese beef noodle soup. The Lensman won’t hear a bad word said about it – he positively loves the firm noodles, the tender, stewed beef and the mildly piquant chilli soup. I wasn’t quite as bowled over with my taro and vermicelli noodle soup, but it was still quite pleasing. Although I’m not usually a fan of vermicelli noodles, I could be persuaded otherwise if they were all as milky and firm as the ones here. The grilled chunks of taro, a root vegetable vaguely similar in taste to yams or sweet potatoes, were firm and starchy and complimented well by the silky mushrooms although the meagre scattering of chicken seemed a little miserly. Apart from a slight saltiness, the soup was inoffensively bland. I couldn’t dine at Leong’s Legends Continue without sampling the xiao long bao once again. These meat and soup filled dumplings should be exquisite, but here the kitchen is clearly treading water. While the thick skins are smooth and supple, what should be richly flavoured soup is rather drab, lifeless and overly dependent on ginger for flavour while the meat filling is grey and anonymous. How very sad. 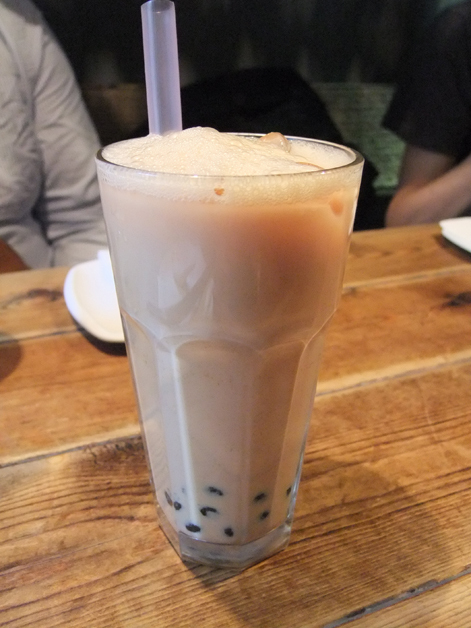 As expected the milk bubble tea is milky and slightly sweet with lots of starchy tapioca balls to muck around with. Another thing that remains virtually unchanged is the sullen, unhelpful and unfriendly staff. They get the job done (eventually), but don’t expect a warm welcome. Leong’s Legends Continue (and the nearby original branch without the ‘Continue’ in its name) used to be one of the most interesting places to eat in London’s Chinatown. While it’s still a dependable standby for some of its core dishes, the rest of the expansive menu is slowly losing its lustre as the kitchen cooks by numbers, rather than with passion. Reservations: recommended, if you can convince the staff over the phone to talk to you in polysyllables. Total cost for one person including soft drinks: £12-15 approx. 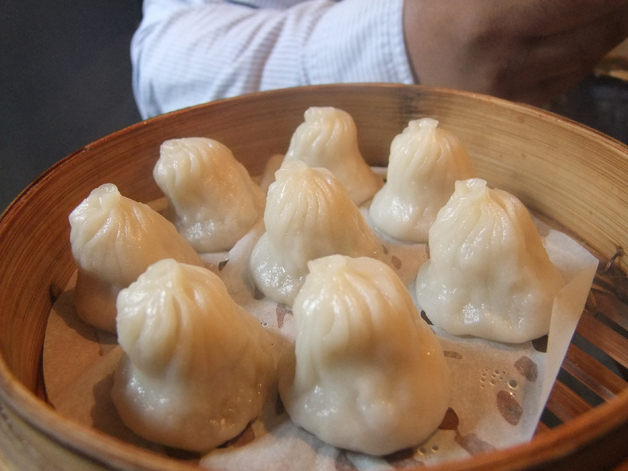 Tags: dumplings, leong's legends, london, noodle, restaurant, review, soup. Bookmark the permalink. Had dinner here last night. I found everything way too sweet, even the supposedly spicy szechuan style noodles. It was edible, but by no means a great meal.